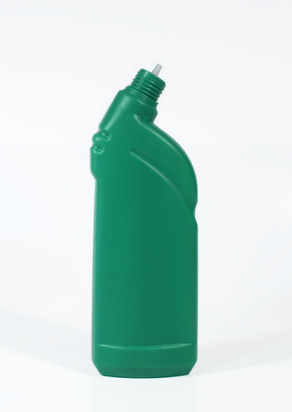 Drain cleaners are used to remove clogs from drains,and are available in several different varieties. Clogged drains are a result of organic or inorganic materials sticking to the walls of the drain and impeding water flow. Organic clogs are made of materials such as hair, skin, paper and waste, while inorganic clogs are made of materials such as plastic and metal. Many clogs build up over time and may be composed of both organic and inorganic material. In order for a drain cleaner to remove a clog, it either has to dissolve it to the point that water can flow through the drain once again or break it apart so that the remnants of the clog can be washed away. There are four main types of chemical drain cleaners: acid, caustic, enzymatic and oxidizing. Acid and caustic drain cleaners use harsh chemicals to break down organic materials that are clogging a drain, reacting chemically with the materials in a clog in order to dissolve the material and release heat which can dislodge other portions of the clog. Enzymatic drain cleaners use natural bacteria and enzymes to break apart clogs, digesting the organic materials that the clog is made of. Oxidizing drain cleaners use chemicals such as peroxides and hypochlorites, which react with clogs in a similar manner to the chemicals used in acid and caustic drain cleaners, releasing large amounts of gas in addition to heat which helps to break the clog apart. All four types of chemical drain cleaners work best on clogs made of organic material and may not work well on inorganic clogs. Pulse jet drain cleaners use water pressure instead of chemicals to break apart clogs. These drain cleaners consist of a high-pressure pump, similar to those used on pressure washers, and a wand nozzle, which can be inserted into the drain. The pump delivers high-pressure pulses of water through the nozzle, breaking the clog apart by force. Pulse jet drain cleaners can be used on organic and inorganic clogs alike, but may not be appropriate for all plumbing types due to the pressure that they can place on the pipes themselves. Auger drain cleaners, also known as "snakes," use a cable that is rotated within the pipe to break apart clogs. These drain cleaners can be either manually or mechanically operated and are effective on all clog types. Manual auger drain cleaners may have difficulty breaking apart thick clogs as their power is limited by the strength of the person operating them, whereas mechanical units are motor driven and are capable of breaking apart most clogs with little difficulty. Care must be taken when using mechanical augers, however, as they can produce a large amount of torque and can be dangerous if not used correctly.